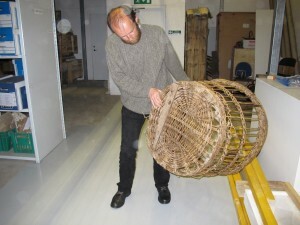 Ian Tait, the director of Shetland museum, has been a great correspondent during this project. Despite the great demands on his time, Ian devoted the whole day to me when I visited with Jon in 2012. This began with a tour around Shetland Museum, which has to be one of the most well set out and rich collections of material culture in Scotland. I learned a huge amount during this tour. Ian has thought a great deal about Shetland’s basketry heritage and conveys it very clearly. The Eshaness basket – a 7th century willow basket – came from Shetland, although it is now held in Edinburgh. Ian was able to talk us through from the pre-Viking and Pictish era onwards to the ‘complete break with the past’ in Shetland’s material history which came with the Vikings. A key moment, he said, in Shetland and Orkney history, was the 15th century marriage of the Scottish prince with a Danish princess, through which event Scotland gained Shetland and Orkney from the Danes. 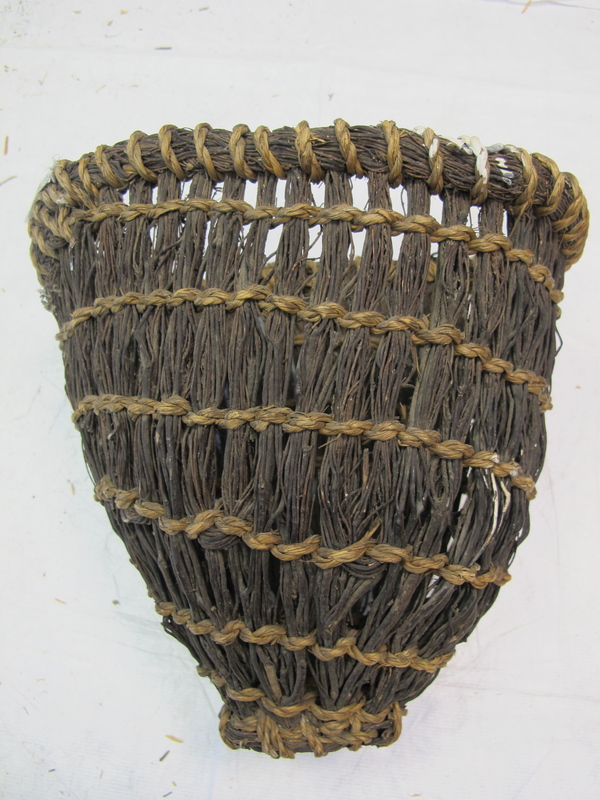 From this time on, the lack of wooden imports from Scandinavia brought an increased us of straw, heather and grass in architecture and smaller artefacts, which may account for the number of basket items made from these materials. 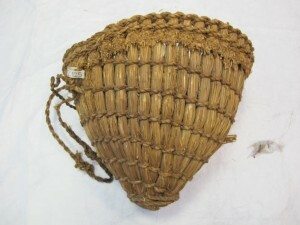 Our whole afternoon was spent in the stores with Ian, and we were able to see the magnificent collection of kishies, bødies, kuddis, toigs, ropes and other artefacts, in all manner of material, from black oat straw to docken, which the museum holds. It is difficult to imagine we could have achieved more in a day.